Other names: Peruvian cacao, tigr cocoa, motelo, patashte. Mocambo is believed to have originated in Central America. 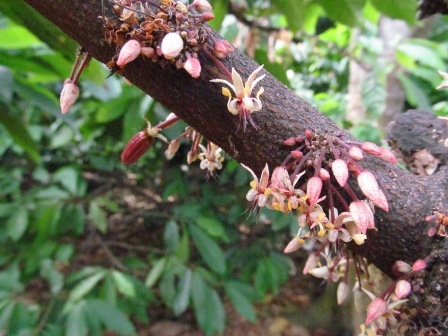 It is widely cultivated in Mexico, Belize, Brazil, Colombia, Costa Rica, Ecuador, El Salvador, Honduras, Mexico, Nicaragua, Panama, Peru, Venezuela etc. An evergreen tree, 5-8 m tall when under cultivation but growing upto height of even 30 m when growing wild in forests. 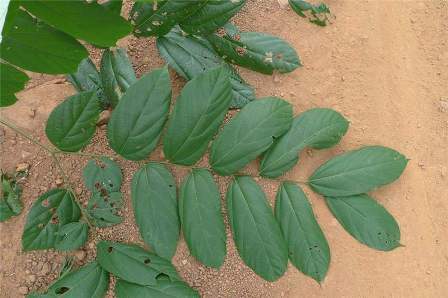 Leaves chartaceous, bicoloured, 15-35 cm long. Flowers n small dichasium on thin branches. Fruits ellipsoid berries, 15-20 cm long and 10-13 cm wide, weight 0.5-3.0 kg, having a woody pericarp, with ten longitudinal segmnents, grey or greenish before maturity, yellow to yellowish brown when fully mature. Seeds 30-50 per fruit, wrapped in a succulent fibrous cream to yellow coloured pulp. The pulp (aril) has a sort of uncommon odour. It is mildly sweet. The taste resembles somewhat that of Jackfruit. Pulp is eaten fresh. It is also used to prepare juice or ice creams. Pulp is also used in beverages and desserts. The seeds are used in soups, or fried as a snack. 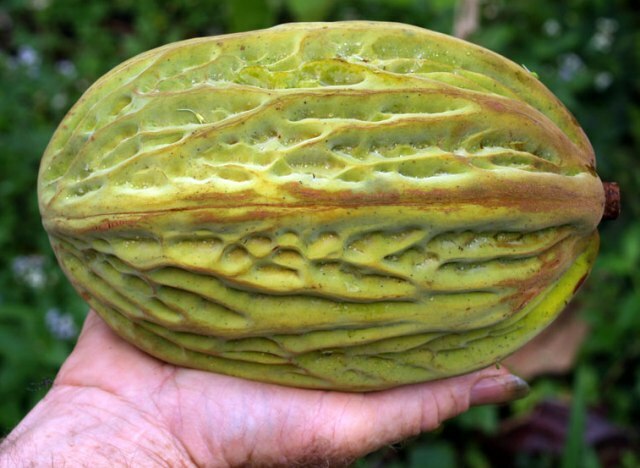 The seeds are consumed roasted, boiled, in pastry, and to prepare a poor quality chocolate. 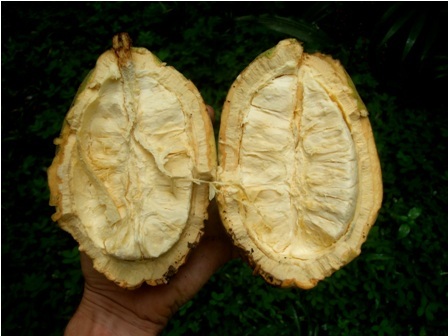 The beans are sometimes used to adulterate true cacao produce. The empty pods are used as containers and for starting plants. 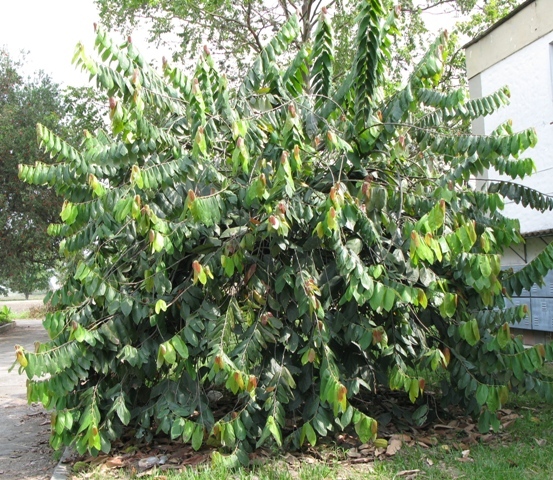 Mocambo is a fast growing tree and can be very productive. It has a small canopy, and can be intercropped with many tree species. It prefers alluvial soils and tolerates minimal flooding. Some seem adapted to deep and prolonged flooding. Mocambo also does well in upland environments. It is propagated by seed. Mocambo coppices fairly well, and can produce fruit at times when other fruits are scarce.